As a movie geek, it only stands to reason I’ve become a movie theater geek, too. Over the years, I’ve seen countless movies in countless places. Sure, there are countless ways to experience that precious “on demand” movie-watching experience. However, sometimes you just gotta go OUT to the movies. Going to the movies is not a passive experience. 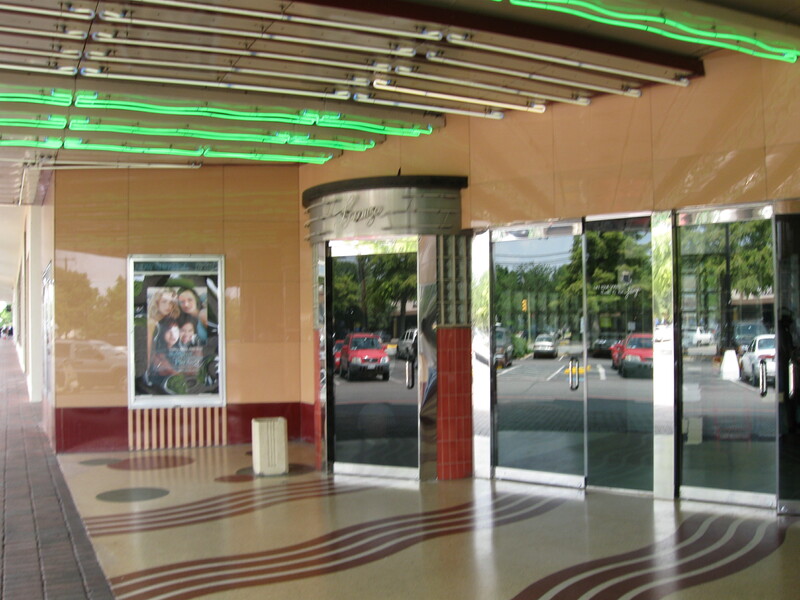 It’s an affirmative shout out from you to your community that you are engaged, whether it is at the tricked out multiplex, the dollar theater or a special ‘location’ screening in a quirky place. Sure, there are times to stay in and watch a flick, but there are times when you need to get OUT and GO see a movie! And the Inwood Theater in Dallas, TX is just the place to go catch a flick. It’s the details that mark the Inwood’s history. Your first point of contact lets you know you’re in for something special. The entry door, with its brushed steel bars and port hole windows, evokes a Titanic-era moment. Once inside, the soothing marine theme sweeps over you from the sea foam green lush carpet, the pastel neon lights, the Boticelli-like murals of water nymphs and the ‘floating’ etched glass of aquatic life that floats along the railing as it curves up to the balcony all evoke a soothing marine serenity. One look around, from the soaring lobby to the Inwood Lounge beckoning you from behind glass block tile, and you know the Inwood is a special place. The Inwood opened its doors in 1947 showing Red Skelton’s The Show Off. Built by the Texas-based Interstate Amusement Company, the Inwood was a one screen movie house that boasted the latest in film exhibition technology and comforts. The original auditorium seated 1,100 with enough room between rows that seated patrons did not have to stand to allow others in and out. A special new acoustical plaster, produced and developed in California, was used on the auditorium walls. But, best of all the Inwood was air-conditioned and it had a top-of-the-line RCA Sound System. Over the years, the Inwood, like so many one screen theaters, fell victim to dwindling attendance as movie audiences sought newer theaters with newer equipment. In 1980, when the theatre began running as a discount house, a devastating fire closed its doors. Fortunately, in 1981, the Inwood re-opened, with the addition of a second theater. The following year, the balcony added a third theater and the Inwood Lounge opened. Films in the balcony screening room are shown from the original projectionist booth. In 1988, Landmark took over the struggling arthouse in the same year that the Inwood Tower sign was designated an official landmark by the Dallas City Council. That same year the USA Film Festival hosted Joe Bob Briggs “World Drive-in Movie festival” at the Inwood. Landmark’s love for old theaters is reflected in the lovingly kept the Inwood open over the years as well as maintaining the structural integrity of the building as much as possible. A silent remnant of another time in movie history still hangs forgotten on the wall, a heavy black Stromberg Carlson in-house communication system which bears the Graybar Electric manufacturers patent of July 7, 1914. In January of 2005, following the purchase of Landmark Theatres by Dallas based Todd Wagner & Mark Cuban, the Inwood Theater was extensively refurbished. Maintaining the integrity and beauty of the original theatre, the theatre’s murals were touched up and re-lit, its historical neon sign was re-built and the upstairs auditoriums were transformed into screening rooms replete with leather lounge chairs. In addition to new carpet, seats, sound and screens, the concession stand and bathrooms were also upgraded for your comfort and convenience. In May of 2008 Landmark Theatres introduced its newest Screening Lounge Auditorium at the Inwood Theatre. This unique auditorium—the first of its kind in Texas—gives audiences an unparalleled movie-going experience. Working in partnership with the LoveSac® Furniture Company, Landmark completely re-invented the first-floor auditorium of the Inwood with a variety of unique seating options including couches, loveseats, chairs and ottomans, as well as the original LoveSac. A private bar also was added, allowing patrons to purchase cocktails and soft drinks without ever leaving the auditorium. Lucky for us. Now you can enjoy independent, first run and foreign-language films on any of their three screens from this one of a kind, only-in-Dallas movie theater. So what are you waiting for? Go check it out!